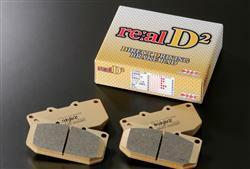 JIC Brake Pads - Real D2 Performance Pads - Dezod Motorsports Inc - Home of the automotive performance enthusiast since 2002. Ideal for the weekend autocrosser and weekend warrior, the REAL D2 Brake Pad has been designed for aggressive driving on an auto x course and harsh driving situations. Like the REAL S2 brake pads, the brake dust is reduced far more than factory and performance gains are noticed right away.